“Welcome to paradise” could be said by anyone in the Dominican Republic. It is a beautiful country with a colorful and vibrant -and loud!- culture. First a few words about Dominican Republic and the area I visited. Dominican Republic is an island in the Caribbean neighbouring Haiti. In Dominican Republic the spoken language is Spanish and they use both pesos and US dollars. Dominicans are very bubbly, happy and loud which really gives you the Caribbean vibes. I guess a blond blue-eyed girl is a head-turner almost everywhere in the world but in Dominican Republic even small boys shout “I love you baby”. Hahah, feeling like a movie star! Samaná harbour is so beautiful! Samaná is a cape located northeast of Dominican Republic. Samaná is especially known for its whales and beautiful beaches. In Samaná there is also a town with the same name. It is a fairly small town with only a few restaurants, bars, cafes and shops. It has a beautiful harbour where most of the excursions leave from. Samaná town has one beautiful beach called Playa Cayacoa. It is popular among tourists and during the weekends also the locals come there to spend time. It’s not a crowded beach though, it is lovely and quiet especially on weekdays. The water is shallow enough for a relaxing swim and the base of the sea is soft sand. On top of the cliff is a hotel called Grand Bahia Principe Cayacoa which owns most of the activities on the beach. I stayed in Grand Bahia Principe Cayacoa which is an all-inclusive, quality hotel. I can recommend this hotel as a place to stay in Samaná. Food is delicious, service is good and the pool areas are great. The location on top of a cliff is also phenomenal! Grand Bahia Principe Cayacoa’s pool was amazing! And this was only one of them. Next to Playa Cayacoa are the Samaná walking bridges. The bridges connect two small islands and the idea behind them was to build a new harbour on the last island. The harbour was never finished due to the government not giving anymore money for the construction. Now these bridges form a nice outdoor path for travellers and locals with a perfect view to the town and to the sea. Samaná bridges – perfect place for an evening stroll! One of the greatest experiences on my trip was no doubt whale watching! Whales (ballenas) come to Samaná waters to breed and they can be seen from January to March. I visited Samaná in February which was just the perfect time to spot these magnificent creatures. My first tip would be to choose your boat carefully. I got help from getawaydominicanrepublic.com to organize my tours and I can highly recommend them! They booked me an excursion with Eva Tours and they had a proper double storey boat which had space well for everybody. What a show the whales gave us! I have a very good stomach for seas and I rarely get seasick! But god the waves hit us hard! In one moment we saw the sky and then again towards the water. I was extremely glad we had a proper boat and not one of the smallest ones that disappeared in between the waves packed full of people who all stood and tried to get a glimpse of the whales. The sea was so rough that at least four of our twentyish group of travellers became seasick. Whale watching in Samaná was one of the best experiences ever! WE DID SEE THE WHALES! We saw three of them and they came to hang around our boat. They are such wonderful creatures! I have such a bad luck in seeing any kind of mammals or sea creatures that I thought I would cry if I actually get to see them. I appreciated that they had a rule that only three boats can go close to the whales. They can stay there for 30 minutes and then they have to give space for others. It was all in all well organized! The whales were so magnificent! After the whale watching we went to a paradise island called Cayo Levantado. Some people had lunch there but I was happy with the crackers I had taken with me since my stomach was feeling a bit weird after the rough trip in the sea. The island is a real PARADISE: white powder sand, palm trees and turquoise water. Paradise island of Cayo Levantado in Samaná, Dominican Republic! I did some snorkeling on the island but nothing that special can be seen there. I saw a few parrot fish, a trumpet fish and beautiful starfishes and shells. Basically most of the coral looked long gone so nothing too colorful to be seen but it was lovely to snorkel a bit. The awesome thing was that I was able to snorkel basically alone and enjoy the underwater life without others! Love love loving Cayo Levantado! I did fall in love with the island of Cayo Levantado! It truly was a paradise! There were touristy souvenir stalls but nothing too bothersome. 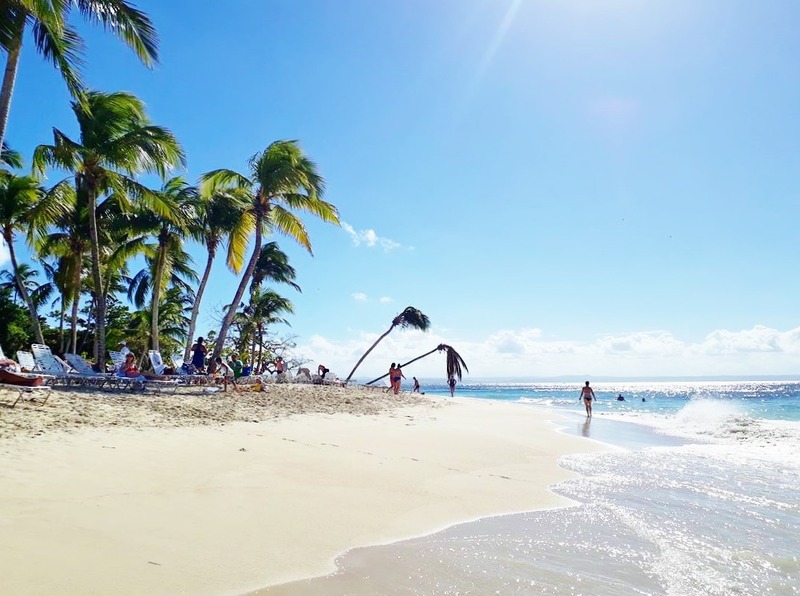 Palm trees and white powder sand – such a dreamy place, Cayo Levantado! As a summary: Samaná town is a beautiful local town equipped with a beautiful boulevard by the harbour. There is also a very limited amount of people pushing their products and services on foreigners. There aren’t many tourists so what you see is a lot of local life all around you! Take a visit there or stay longer in a quality hotel, it’s your choice. 😉 Just see the whales, Cayo Levantado and the walking bridges! This was the first part of the Dominican Republic story so stay tuned for the next article about my road trip experience. Interested in visiting Samana? Read my article of extremely exciting roadtrip that I did in Samana!